Home and Garden TV, better known as HGTV, shares a number of backyard tips that you can try to spruce up your property without breaking the bank. Their website offers suggestions from fire-pits to barbecue equipment as well as ideas for bringing together color schemes. Other suggestions include information on adding back decks, hot tubs, gazebos and even simple benches that add charm to the property. Another backyard favorite of the folks at HGTV is back yard entertainment. These include big screen televisions, projectors and surround sound accompanied by a couple of rows of chairs, bringing the feeling of a drive-in movie to your house. A backyard bar is perfect to serve the “movie goers” refreshments, creating a great atmosphere for a summer get-together or even a Super Bowl party. Children’s resources such as see-saws, treehouses and swing-sets are also a fun addition to your home. Some of the HGTV shows have shown incredible play areas incorporating the latest in playground technology for the children of the house. Unfortunately, while all of these ideas are great, few homeowners have the budget to do everything they want to their homes. What ideas can you salvage from these shows that will be usable and will truly add long-lasting value to your property? The answer to that question lies in how much you want to spend and how much time you spend outdoors. According to experts, you can earn a 150 percent ROI by spending five percent of your current home’s value on inexpensive but quality backyard upgrading; if your home is worth $100,000, and you spend $5,000, you can add $15,000 to your resale value to your property. Additionally, according to a study by the University of Michigan, a home with good landscaping is valued at more than 10 percent higher than an identical house without it. You can also lower your current living costs by selecting the right trees and plants to place around your house. Deciduous trees lose their leaves in winter and grow full in summer. This provides your home shade in summer and sunlight in winter, lowering your heating and air conditioning bills respectively. How Can I Get Started With The Right Landscaping? 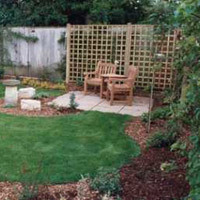 Juniper Landscape Company has been serving San Diego with quality landscaping for over 40 years. We are a provider of professional landscaping services and strive to make San Diego a beautiful area by conducting business with integrity and creativity. To get your landscaping project started, give us a call today for a free estimate.